Recently, I read about a new book for elementary school teachers that wish to include LGBTQ topics in their English Language Arts (ELA) instruction. 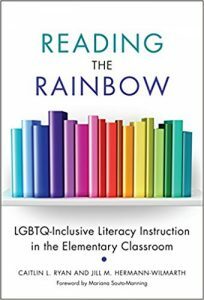 Reading the Rainbow: LGBTQ-Inclusive Literacy Instruction in the Elementary Classroom (Teachers College Press and GLSEN) offers teachers “tools for addressing LGBTQ topics in their ELA teaching.” The authors, Caitlin L. Ryan and Jill M. Hermann-Wilmarth, are both former elementary school teachers themselves and drew upon their own experiences as well as those gleaned from their studies of the classrooms of three other teachers over several years. The authors delve into why LGBTQ people and ideas belong in classrooms as well as exploring the implications of how they are represented. For teachers in areas where they face opposition to LGBTQ-inclusive books, they offer tips on exploring topics such as gender and sexual orientation even without such materials. Of course, they also include a list of such books, as well as resources for teachers to get support, including the Gay, Lesbian & Straight Education Network (GLSEN), the Gay-Straight Alliance (GSA) Network, the Human Rights Campaign’s Welcoming Schools project, and the Family Equality Council. All in all, it appears that this book will become an important resource for elementary school ELA teachers. So naturally, this got me wondering about our own schools and how they handle such topics. In addition, there are curriculum resources and lesson plans for every grade from pre-kindergarten through high school covering a variety of topics, and making use of a number of great books, including Uncle Bobby’s Wedding, And Tango Makes Three, and I Am Jazz. For middle and high school students, there are more in-depth lessons covering notable and famous LGBTQ people, LGBTQ stereotypes, and anti-LGBTQ bullying and harassment featuring both books and video. The district does seem to have a lot of resources available. I don’t know how much of this has made it into my kids’ education — I know they’ve read (or had read to them) many of the books used in the district’s lesson plans — but hopefully teachers are using these resources in planning their lessons. I do know there have been posters and activities for the April Pride Month around the elementary school, where I spend a lot of time. I also know that the only comments I’ve ever received from staff and the school community about my ubiquitous pride shirts have been positive. Nonetheless, there is always room for improvement and perhaps Reading the Rainbow can help SFUSD — and other districts and teachers — with doing a better job of including the LGBTQ community in the day-to-day curriculum. What do you think? 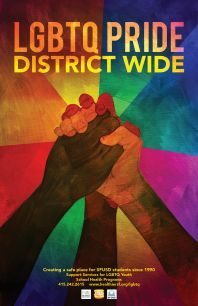 What have been your experiences with LGBTQ inclusivity within the district and its curriculum? How do you think the district could do a better job of supporting and including the LGBTQ community? proudly participated annually since 2007.